The Editor has been quiet for a couple of weeks, but with good reason: she was preparing the keynote “An Up to the Minute Survey of Market Needs and Trends” for the Society of Children’s Book Writers and Illustrators International Conference this weekend. 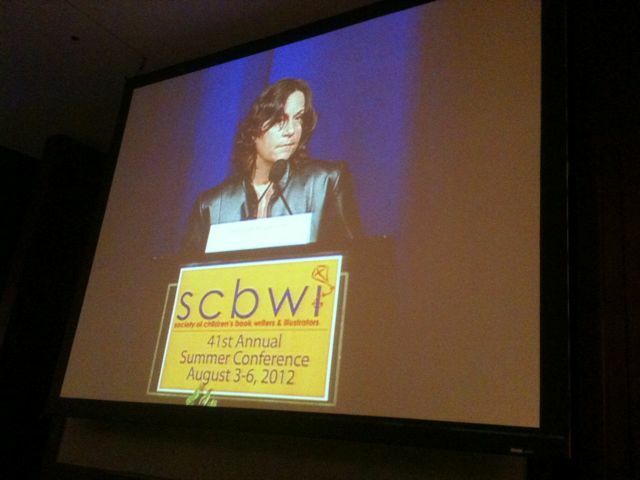 She has just delivered her talk to a full crowd of 1,200, and you can glimpse some highlights at the SCBWI Conference Blog: http://bit.ly/PUnTAo. Starting next week, The Editor will be back online, feverishly answering reader questions about the craft, market, and business of writing. The insights will be coming out in a million ways on this site, you can trust that. The editors, agents, publishers, sales VPs, etc. whom I interviewed in my research for the speech were so generous with their knowledge. I’ll do what I can to enlighten as many as I can. Thank you, Deborah, for being the bearer of good news today. Very much encouraged by your report today at SCBWI. Wonderful speech. Wow! I took a lot of notes and in my sleep deprived state i will need. them. I totally understand the sleep deprivation, Susan. They pack so much amazing information into this conference that I find that when I lay down to sleep, my mind is still feverishly processing. Hope you get caught up on zzz’s quickly so you’re able to start putting the info to work in your WIP asap. Dear Editor/Deborah Halverson, alter egos, very Batman…or is that Batgirl? You always make me laugh, Bill. Thoroughly enjoyed your presentation and left the conference energized and ready to tackle new projects and write, write, write! So glad to hear that, Theresa. Good luck with your WIP! You had me at “triplets!” That you still have hair and were able to string together and deliver a few nuggets to those of us in your session was, for me, golden and inspiring. You had the time slot from hell but were able to keep us engaged. Just reviewing my notes from the Conference, and I had more take aways from yours than any other, but they were all good sessions. Kiss those kiddos and thanks for being part of the faculty. Headed to Amazon to buy the Dummies book now. Ha! Kathleen, the trio is growing up and getting much easier. Thanks for your kind words about the intensive. I worked hard to make sure you had things you could apply to your writing when you left that room, so I’m very glad to hear your enthusiasm about your “take away”. If a writer has written a picture book ms with far less text than her usual manuscripts, could she add information to let the editor know what she believes would be happening in spreads where there wouldn’t be any text at all? Normally, this just isn’t done, but a lot of the story is carried by images in this case. Ann Whitford Paul suggested I contact you with this question. Her solution was to submit two manuscripts: one without the descriptions and one with them. The dual manuscript could be explained in the cover letter. I’ll tackle this in a formal post so that everyone can read the answer, Beth. I’ll shoot you an email when the post goes live. I’ll look forward to your post. Thanks! Update, Beth: I’ve asked a Guest Editor to field your question. I’ll be posting her answer shortly. Thanks so much for all the valuable information you provided at SCBWI (and all the advice you provide every day in this column). It was nice to be able to put the name and face together. I appreciate your taking the time to let me know I’ve been helpful, Kirsten. Previous Post Previous post: re: Refer to Parents by Name in Third Person POV?